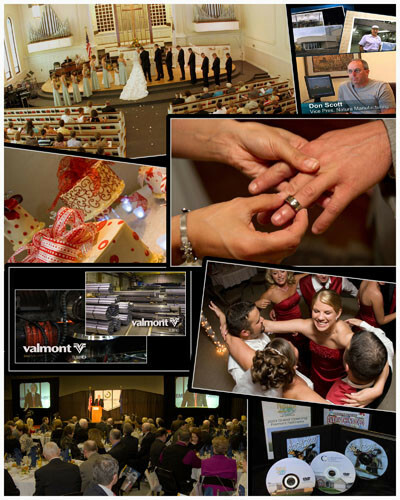 Based in Fremont Nebraska, serving the Omaha and Lincoln area, Vic has been producing video’s for 30+ years, in the corporate and wedding /event markets. Although considered complicated and expensive Vic has packages that are simple, professional and affordable. Your wedding is one of the most important events in your life. Vic will create a lasting memory that your children and grandchildren will someday watch. Vic is in charge of capturing this most important event with video, and will never take that for granted. This is your day to enjoy, and after months of planning, filming is done in a manner that doesn’t interrupt or change the flow of your wedding day. It is Vic’s goal to create a wedding memory that you’ll be able to enjoy over and over again. Contact Vic to understand what he can do for you and your investment. Product – Company Video motivates prospects to buy. Communicate – what makes your business different? Demonstrate – how your products work. The ability of video to improve business is the reason it is rapidly becoming a critical component of business communications. Training Videos – DVD’s are the most cost-effective and time efficient method of capturing your best skills and communicating these skills for performance improvement across the whole of your organization. Vic’s Video Productions can also bring life and clarity to boring, technical training. Training by Video can save many dollars (and time) in travel and accommodation costs! Need your Guest Speaker filmed and put on DVD or Video? Need your Conference or Seminar filmed and put on DVD or Video? Need your Presentation filmed and put on DVD or Video? We can video your Guest Speaker, Seminar or Presentation and put it on DVD. We can include the PowerPoint slides as used by your Presenter at full digital quality. The finished DVD will show the Presenter with the PowerPoint slides fading in and out at the correct locations. On site location services – Multi camera live production, Large screen projection, sound support to enhance your event or banquet. Whether you still have the old home movies your parents or grandparents shot back in the day or your dated videotapes. These can be converted to Digital, and now more convenient to be watched and shared.